How do you manage a child who gets stomachaches every school morning, who refuses after-school activities, or who is trapped in the bathroom with compulsive washing? Children like these put a palpable strain on frustrated, helpless parents and teachers. And there is no escaping the problem: One in every five kids suffers from a diagnosable anxiety disorder. Unfortunately, when parents or professionals offer help in traditional ways, they unknowingly reinforce a child's worry and avoidance. From their success with hundreds of organizations, schools, and families, Reid Wilson, PhD, and Lynn Lyons, LICSW, share their unconventional approach of stepping into uncertainty in a way that is currently unfamiliar but infinitely successful. Using current research and contemporary examples, the book exposes the most common anxiety-enhancing patterns—including reassurance, accommodation, avoidance, and poor problem solving—and offers a concrete plan with 7 key principles that foster change. 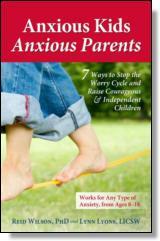 And, since new research reveals how anxious parents typically make for anxious children, the book offers exercises and techniques to change both the children's and the parental patterns of thinking and behaving. Lynn Lyons, LICSW, is a licensed clinical social worker and psychotherapist in private practice. She specializes in the treatment of anxiety disorders in adults and children, including generalized anxiety, phobias, social anxiety, obsessive compulsive disorder, and performance anxiety. She is a sought after speaker and consultant who presents nationally and internationally on the topics of the anxiety in the family, managing childhood anxiety in schools and medical settings, and pediatric hypnosis.